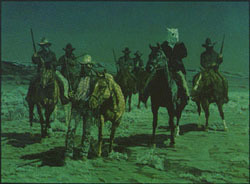 "THE NIGHT RIDERS OF NOWOOD"
The last major raid of the cattle and sheep war of northern Wyoming occurred on Friday night, April 2, 1909. The raid took place on Spring Creek in the Nowood Valley six miles south of Tensleep. The raid was made on the sheep camps of Joe Allemand and Joe Emge. They and others of their camp were murdered by cattlemen who felt that they had crossed the "deadline" and entered designated cattle range. Herbert Brink, a hot-headed cowboy, said previous to the raid, "They will never get through here with their sheep. I am ready to go out with my rifle and drive them back ... we will show them where they belong". And show them they did, although these raiders did not escape the wrath of justice. This tragic event had a very detrimental effect on the cattle interest in Wyoming. Public sentiment had turned against cattlemen, and it became obvious that crimes on the open range would no longer be ignored. Exclusive issue of only 250 signed and numbered artist's prints at $250.00 each. Image size - 18" X 24". This painting was used on the cover of the book "A Vast Amount of Trouble" by John W. Davis.